I’m so pleased to be able to host this giveaway! 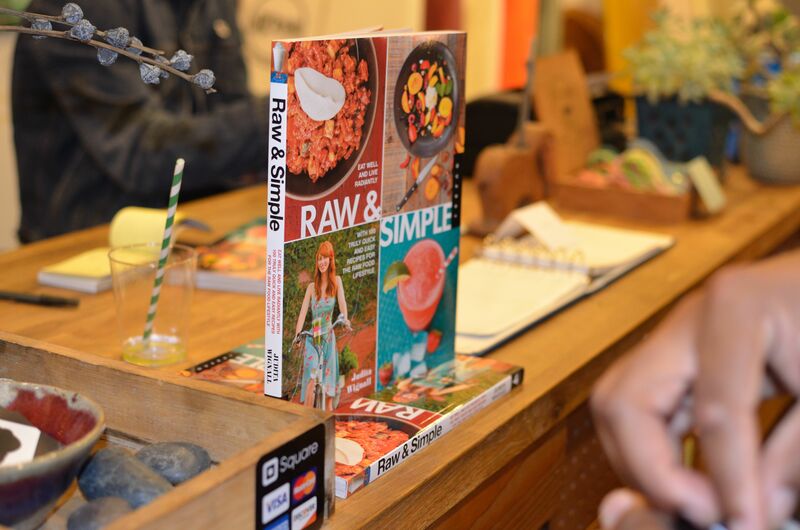 I had the pleasure of meeting Judita Wignall (aka Raw Judita) at her book release and to taste her yummy raw vegan creations. I am still on my juice feast but did take a detour to celebrate this special event. Today is day 24! This book is perfect even if you’re not raw and just want to test the waters. The recipes are simple and if you’re not sure about trying a recipe 100% raw, she offers suggestions for cooked versions for some of them. While at the book release, I purchased a copy for one lucky winner and Judita was kind enough to sign it. 1. Must be 18 years and older. 2. Must be a resident in Canada or the United States. 3. Must be a subscriber to my YouTube channel. 4. Must leave a comment in the Comments section letting me know why you want to win this book. The giveaway closes on Wednesday, March 20th at 11:59 PM PST. The winner will be selected via random.org. 1. Tweet this video (as many times as you would like!) and come back EACH time to let me you did in the comments section. Leave your twitter handle so I can find your tweets! 2. Like my page on FB: http://www.facebook.com/iamEatingRight and come back and let me know you did in the comments section. I posted the link to the giveaway on my facebook page (soulfoodtherapy) AND I sent it to the UC Berkeley facebook page. They will post it before the deadline for the contest. That’s the page for our dining halls. Now, what kind of camera are you using??? Awesome videos!!! And your skin is flawless! Okay, you are going to make me go raw! I’m in the Bay Area – where are you? Hope to stay in touch! Ahh, great camera. I just got a canon a couple of months ago and am finally sitting down to learn how to use it. Who won the cookbook btw?? I announced the winner of the cookbook in today’s video. It was CURLEEDST!